Source: ARTBA analysis of federal Census Bureau data for value of construction work in August 2011-2014, adjusted with the ARTBA Price Index to account for changes in material costs, wages and inflation. Although the real value of highway and bridge construction work was down in August compared to last year, contractors are still performing slightly more work in 2014 than they did through August 2013, according to ARTBA analysis of the latest data from the U.S. Census Bureau. The real value of pavement work in August 2014 was $5.75 billion, bringing the total value of work this year to $29.7 billion. The real value of pavement work was $5.83 billion in August 2013, when adjusted for material prices and inflation. Total work through the first eight months of 2013 was $28.6 billion. 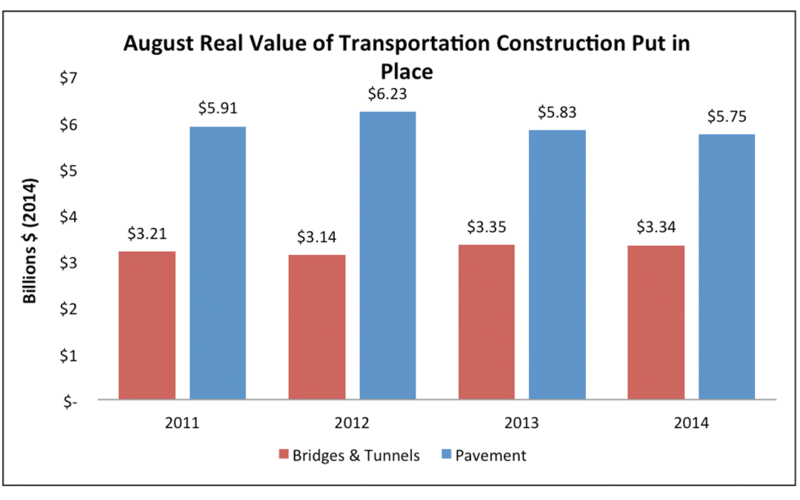 The real value of bridge work was $3.34 billion in August 2014, compared to $3.35 billion in August 2013. So far in 2014, $19.7 billion in bridge work has been completed, compared to $19.4 billion for the same period in 2013. This reflects the highest level of real year-to-date bridge work in 17 years. The real value of railroad work for January to August 2014 was up 4.2 percent compared to the same time period in 2013. Airport work was down 4.5 percent, and subway and light rail work was down 3.1 percent. Detailed data by month and mode is available as part of ARTBA’s market subscription reports. For more information, contact Lital Shair.